﻿The Friends of the Old Croton Aqueduct (FOCA) congratulate the volunteers for their hard work, energy, enthusiasm and spirit of collaboration. There were one hundred and five people who showed up to help for the seventh annual I Love My Park Day on May 5, 2018! An extra special thanks to those who volunteered more than once and a very warm welcome to those who participated for the first time. Did you know that the work took place on top of a working aqueduct that was the first source of water for New York City? It was completed in 1842 and now is one of the sources of water for Ossining. The above ground trail in Westchester was purchased by NY State in 1968 and is managed by the NY State Parks system. Seven years ago we began work on the northernmost section of the trail to manage and eradicate invasive plants, bushes and vines; although there is much more work to be done, it is currently substantially different than it was when we started. We began with the less invaded sections and this year for the first time tackled some of the more heavily infested areas. And this year was the first time we made a concerted effort to count and document how many invasive species we removed. We documented the removal of over 2,400 individual plants and bushes, filled 7 garbage bags of garlic mustard and cut vines on a 3 acre section by the Croton Dam. Our eleven enthusiastic crew leaders deserve a special thank you, all of whom have volunteered with us before: Linda Rohleder, Director of Land Stewardship, New York-New Jersey Trail Conference joined Leigh Draper, Land Steward from Teatown, Bob DelTorto from the Bronx River Parkway Reservation Conservancy, Thomas Lewis from Trillium Invasive Species Management Inc., Guy Pardee from Suburban Native LLC, Stacey Parthemore, certified arborist, Daria Gregg, Citizen Scientist from the Bronx Botanical Garden, and Karalyn Lamb from WCC’s Native Plant Garden. Here they are, including Mike Young, Terrestrial Invasive Species Project Manager and Alex Perri from the Trail Conference as well as our volunteer stone mason George Cabrera, proprietor of J&C Masonry and Landscaping, Inc.
We had help from Brian Pugh, Mayor of Croton. Guy Pardee led a vine cutting group close to the Croton Dam, continuing his ongoing quest to protect native trees from the choking vines that put trees in special danger when storms sweep through. He tutored his crew to prune both high and low to keep the vines from climbing back on the dead vines. Here are some of the members of Daria Gregg’s crew, still smiling at the end of the day. In the morning they worked in a section in Ossining that Daria has been stewarding for several years removing invasive plants, to prepare for the planting of native wildflowers, bushes and trees. In the afternoon they worked on Station 1 assisted by Guy Pardee and supported by State Parks Crew Member Stephen Sciame. We also had support from the Department of Environmental Conservation. George Profous, Forester, led a group of volunteers down the steep slope of the Croton Gorge Unique Area that crosses the Aqueduct trail to do much needed trash removal. And then he supervised a group clearing the trail head. Bob DelTorto has been our pied piper of vine cutting since the beginning and Karalyn Lamb has been an enthusiastic crew leader for several years with her trusty weed wrench. Mary Florin-McBride led an energetic and effective garlic mustard crew for the seventh year in a row. This contingent of parents and children cleared garlic mustard from the trail edges and hillsides, filling many garbage bags with these harmful plants that can contaminate entire forests by suppressing the beneficial fungi that support native trees. Communication along the far flung areas was essential; this year the Trail Conference provided us with walkie-talkies so the crews could communicate with each other and with headquarters. Another innovation was our ubiquitous Trail Concierge, Leigh Draper from Teatown, orienting late arrivals, bringing them to the appropriate areas, and transporting needed supplies on her bicycle. State Parks crew members Tony Failla, Mike Cacace, Stephen Sciame and Thomas Kearney supported the efforts of the volunteers, including driving supplies and water where needed. Tony was omnipresent on his blue tractor, mulching all of the invasive bushes and vines left trailside and transporting the stones needed for the stone wall repair. Steve Oakes, the State Historic Parks Manager, kept us motivated and pitched right in working alongside the volunteers. Excavation then had to be completed by hand. Neighbor Gareth Hougham is working with George, assisted by Charlie Beckham who traveled all the way from Middletown to help with the stone wall work. This year Riverkeeper.Sweep collaborated with us, resulting in the participation of one of their sponsors, Louis Berger Company; a dozen of its employees and family members joined us, many of whom worked on the stone wall restoration. They can be identified by their blue t-shirts, some hiding under the purple I Love My Park day shirts. Here is George putting the finishing touches on the completed restoration. The stone wall crew was very ambitious and repaired a second section. Here is the crew that remained at the end of the day; proud and smiling: Miguel, Charlie, George and Gareth. In addition to our crew leaders, we had significant support from our local and corporate sponsors, many providing assistance year after year. Returning corporate sponsor, Avalon Ossining, its apartments straddling the trail in Ossining, generously donated funds needed to provide supplies for the volunteers. Mrs. Greens in Briarcliff contributed healthy delicious fruit and snacks. The Black Cow Coffee Company, as they have done every year, provided the morning coffee that inspired us! Our newest local sponsor, Baked by Susan, provided delicious goodies to accompany the coffee, much appreciated by those who arrived in morning. Our newest corporate sponsor, Mario Conte, of MC Electrical Construction, local licensed electrician par excellence and Master electrician, donated the funds that paid for all of our publicity and some of our other expenses, including the numerous flyers and lawn signs you may have seen around town. A lunch time prize drawing was held as is traditional with this event, sponsored by Feed the Birds and Run On Hudson Valley. Lucky winners went home with gift certificates, bird feeders and flash cards. Yadnesh Borse handled the prize drawing, as he has done for many years. We thank all of our local and corporate sponsors for contributing so generously. We encourage folks to patronize these sponsors and let them know of your appreciation for their participation. Two of our crew leaders have companies which can help you deal with invasions in your backyards: Thomas Lewis from Trillium Invasive Species Management Inc. and Guy Pardee from Suburban Native LLC. Our volunteer stone mason George Cabrera of J& C Masonry and Landscaping Inc. can repair your stone walls and then some and our newest sponsor, Mario Conte Master electrician of MC Electrical Construction, will amaze you with his skilled electrical work. The Town of Cortlandt provided parking dispensation for the volunteers. And Dana Levenberg, Supervisor of the Town of Ossining, came to cheer us on and then with gloves and loppers set to work. Special thanks to our volunteer photographers who documented our work, including high school student Adriana Cuibus of Hastings, William Garandeau, John Salmon, Lesley Walter, Jeniffer Mora, Sara Campbell and Joseph O’Hagan. 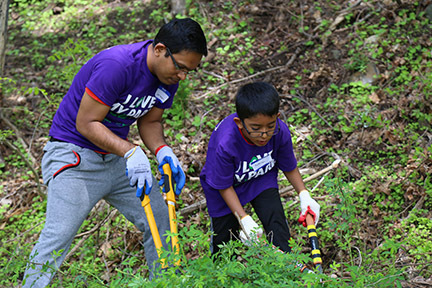 New York State Office of Parks, Recreation and Historic Preservation, in partnership with Parks and Trails New York initiated the I Love My Park Day events throughout New York State. This was the seventh time FOCA has hosted this annual event. The weather cooperated and in terms of results, it was the best ever. The substantial achievements were the result of the planning and collaboration between the many community organizations, crew leaders, municipalities and sponsors working together along with the volunteers to enhance the ecological health of the trail and preserve its natural and historic beauty. We invite you to walk the trail and see what was accomplished. Walking south of the Croton Dam you will see healthy trees freed from covers of invasive vines. Marvel at the historic stone walls now visible and try to identify those that have been repaired and restored. Enjoy hillsides dotted by Christmas ferns, witch hazel and spice bushes and other native plants thriving now that they are no longer being swallowed up by invasive species. If you would like more information about our past such efforts, we invite you to go to http://aqueduct.org/invasive-plants-old-croton-aqueduct.